Last week we published a teaser look at Intel's latest mSATA SSD: the Intel SSD 525. At the time we only presented performance for a single 240GB drive, however Intel decided to break the mold and send us nearly every capacity in the 525 lineup. We've finally completed testing of the remaining capacities and can now bring you a full look at the Intel SSD 525 lineup. Typically manufacturers send along their best performing SSD and what follows after launch is a bunch of begging for or outright purchase of additional capacities in order to present the most complete picture. Intel was one of the first companies to send along both large and small capacity SSDs in for review, so it's no surprise that they're one of the first to send nearly every member of a new SSD family for review. I can't stress how important it is that other manufacturers follow in Intel's footsteps here. 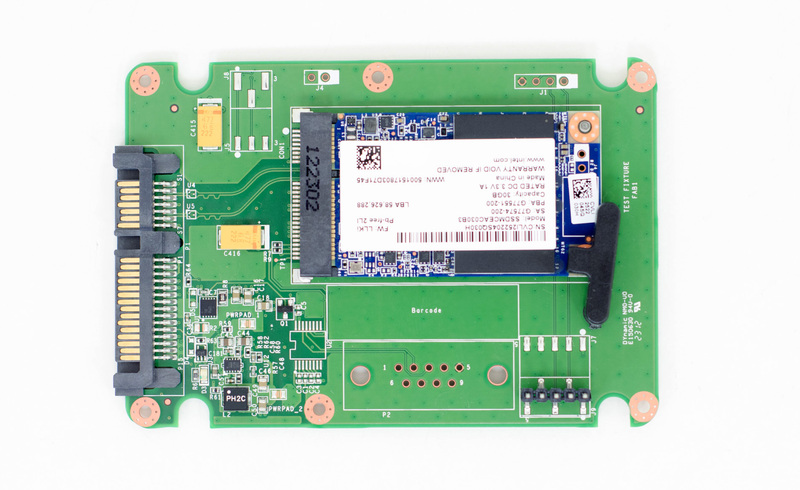 Given the direct relationship between the number of NAND die/packages on an SSD and the performance of the drive, being able to demonstrate the performance of the entire family is very important to those looking to make an actual buying decision. In the case of the 525, Intel did a good job of keeping things pretty simple. Since the 525 is exclusively an mSATA drive, there's only room for a maximum of four NAND packages on board. The 525 still uses 25nm 2bpc MLC NAND, which is limited to 8GB of NAND per die and 8 die per package (64GB max per NAND package). This is where the 240GB max capacity comes from (256GB of actual NAND). All of the 525 members feature the same ~12.6% spare area (~14% OP). Despite the reduction in number of NAND packages, the 90 and 180GB models aren't actually any slower than the 60GB and 120GB versions respectively. The reason that performance doesn't suffer when going to these odd sizes is because Intel/SF do a good job of parallelizing requests across all NAND die within a package, of which there are physically more in the 90/180GB configurations compared to the 60/120GB models. I went over the rest of the details of the 525 in the initial review. In short, the SF-2281 controller is still at use but paired with firmware that's directed/validated by Intel. Performance, compatibility and stability can be different on the 525 compared to other drives that use SandForce's SF-2281 controller. The 525 in particular uses a newer version of the Intel branch of the SF-2281 firmware with additional stability/compatibilty enhancements and power optimizations. The 525's LLKi firmware revision hasn't been backported to the 520/330/335 and as of now there aren't any public plans to do so. The 525 also comes with a 5-year warranty from Intel. "At the time we only presented performance for a single 240GB drive, however Intel decided to break the mold and send us nearly every capacity in the 525 lineup." first what mobo can I buy that will run at sata III speeds. I have 3 mobos with msata's all 3 use sata II speed's. second question when will the crucial m500 480gb drop? third question which has nothing to do with msata just sata. when does sata IV come out. I get a bit bored with ssd reviews since speed is pretty much capped at 550 read write. 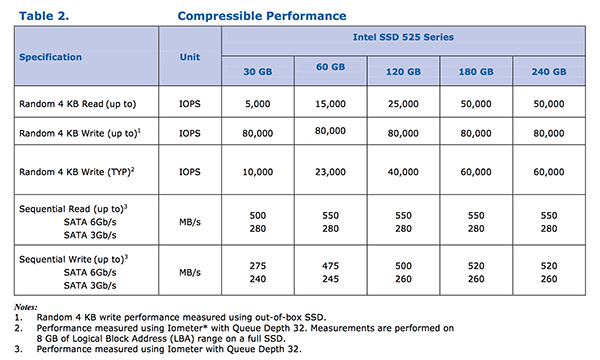 iops are not going to go to 550 read write at random 4k. so sata 4 would mean all new speeds to droll over. a bigger msata like the crucial m500 would be nice. and an itx board that used msata at sata III would be nice. not knocking intel but ssd's seem to have become more of the same. As Jimmy Fallon would say bigger harder faster stronger. oh one last thing the 5 year warranty is nice. Crucial M500 is Q2'13, that's all we know for now. I'm very interested in the drive as well, hopefully we can get samples soon. But seriously, Anandtech. Let's talk logic here. Intel has specification sheets with detailed power consumption numbers. 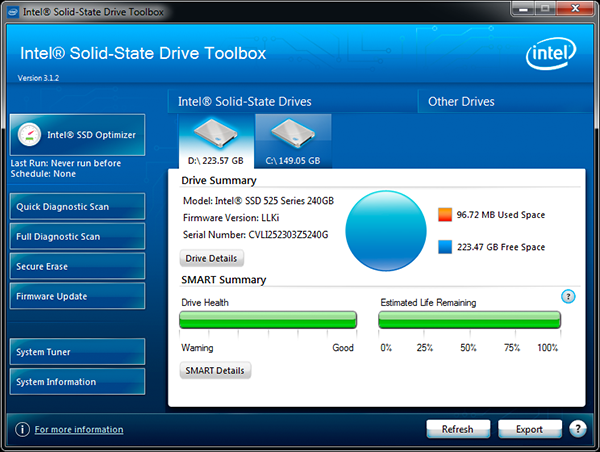 It says for the entire SSD 525 series: 250mW idle typical, 300mW under mobilemark 2007. How can you look at your own power consumption numbers and say 'well, close enough, let's just publish it even though it's 100% too high and clearly not correct'? As I mentioned in the review, the mSATA adapter we test with only supplies 5V to the drive. To address this going forward I need to modify a board with a native mSATA connector and measure 3.3V on the board itself. The results here at least allow you to compare the various capacities of the 525. MobileMark 2007 is mostly an idle test, which is why none of our loaded numbers have ever come close to any spec sheet that reports it. This is the same reason we don't use it in our notebook reviews. We will be switching to DIPM-only testing in our 2013 storage suite update, which will unfortunately break backwards comparability with our older results. What mSATA adapter board are you using? Also note that those mSATA to SATA converters use a little linear regulator(like a 7833) to convert the 5v to 3.3v. Linear regulators are very in-efficient, as they essentially turn the "extra" voltage into heat by using a network of resistors. If you are simply measuring the power into the adapter then you are not getting a very good look at the actually mSATA device power draw.